In late February 2015, I sat down with my mom and we communicated with each other about how, now that I was officially out, and how it was clear that the Catholic Church was not going to embrace queer and trans inclusivity anytime soon, that we did not intend to engage with this community anymore. I was a Catholic School graduate who wore a Miraculous Medal around my neck. I was a girl who wanted to add my confirmation saint’s name to my own name legally. My favorite times of year were the third week of Advent and the May Procession, and I thought it was so grand that I got to go to Christmas Eve mass on my birthday. I was a girl, who, when I was five years old, wanted to become a saint, and still sort of did at fifteen years old. To leave the Catholic Church was a choice I made, but it was with sadness. I did not want to associate myself with a dogma that was not only explicitly anti-queer, but also did not approve reproductive rights, divorced people, and many other causes and communities that I fought for. The dogma may not reflect the views of the members of Church, but I did not see any challenges to the exclusivity. It was a matter of following my values or following the religion. I don’t know the exact day this conversation happened. I wish I had marked it down, because I want to know if it matched up with February 26, 2019, the day when the delegates of the United Methodist Church who were present at the Special General Conference in St. Louis, MO voted to uphold and strengthen the anti-queer rhetoric within the Book of Discipline. 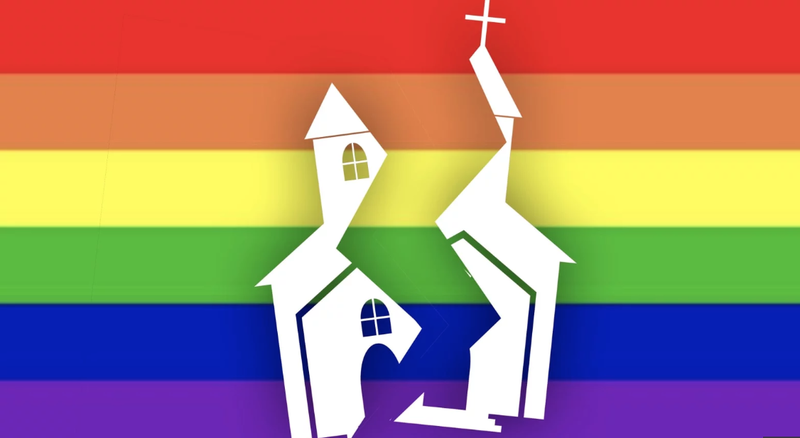 This meant that the denomination did not condone queer and trans people having full participation in the church — as married members, as clergy. The vote passed by a small margin. I must acknowledge something before any of this: I am not really even a Methodist. I don’t even know if I am a Christian. But there are people I care about who are a part of these communities, and there are parts of these communities I wish to engage in. I am a part of a local Methodist congregation that is queer-affirming. I began attending once college started because I did not want to give up on church even though I had thought church had given up on me. Before college, I had been told what my faith was supposed to mean to me, but now, I am allowed to decide. I am having a difficult time separating what was held above my head as requirements and what I feel in my heart as true and healthy and safe. The week leading up to the General Conference, I was feeling things that were way too close to how it felt the time after my 2015 decision. I would text my friends when they asked me how I was. 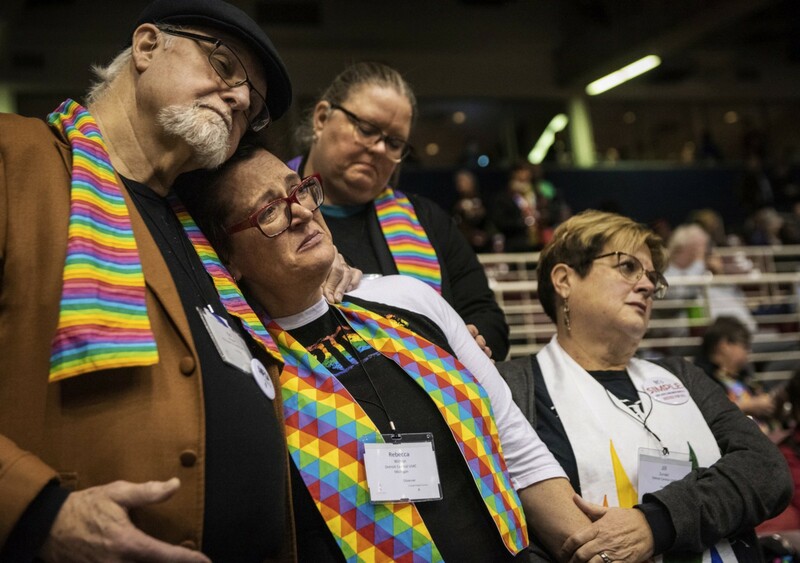 There were livestreams made available for all four days of the general conference, both of the official proceedings and of the peaceful demonstrations made by the queer/trans and ally Methodists, working to end the spiritual violence of queer- and transphobia. Working to dismantle the colonialist concept of queerphobia. Praying on their feet and with their songs to disarm the discrimination that they believe — and I believe — was the same kind of discrimination that Jesus condemned. They wore rainbow stoles and sang protest and worship songs by Methodists like Mark Miller (who is a part of the theological school within my university). These lyrics affirmed the totality of God’s family. That borders should be broken down. That dissent to oppression is our holy duty. I took a video on my phone of the final vote as it played on my laptop. I needed to make sure I kept this historic moment in the church and of my own life. My family was watching at home as I sat at a table in the dorm lounge, the same table where I sat 6 months before when I read a passage on a link for queer-affirming scripture, Galatians 3:23–29: “There is no longer Jew or Greek, there is no longer slave or free, there is no longer male and female; for all of you are one in Christ Jesus.” A passage that brought tears to my eyes and helped me start thinking about coming back to church, later that night I started googling congregations in the area, emailing pastors to see if they were queer-affirming;. I watched the vote happen, I watched the Traditionalist Plan pass, I heard songs of protest not even moments after, livestreams of queer Methodist groups already popping up on my timeline. They were fighting with all of themselves. They were standing firm in their commitment to save queer and trans lives. Comments of support from all around the world were popping up, and the person taking the video was reading these comments to the protestors. While still playing the other, I pulled up another livestream of a group standing outside the doors to the dome, chanting to “open the doors,” so they can join the protest. This synergy of this group was exquisite. To relay messages to the group, faith leaders shouted “mic check” and began a call-and-respond, repeat-the-message communication. They led the group in prayer. The people erupted in song, the leaders corresponded with bishops and the surrounding police to get information about what was going on inside, live streams were being played on multiple phones. Those present who were queer/tran and allies and of color created another space to process and sing. The faith leaders began serving communion to those present. Those who were shown within the first livestream walked into the lobby to meet those in the second livestream. I watched both of my screens converge into one place where this history was happening. Those leaving comments on the livestream — Protestants, Catholics, Jews, Non-religious — keep calling this event something I had not heard of before. A witness. It was the first time I had come to understand what working for justice meant. All I wanted was to be there. All I wanted was to keep this witness going with these faith leaders. This is the prayer I want to be doing every Sunday, I want to stare injustice in the face and sing. I want to organize in tune with the heart of my community. I want to fight for those who are persecuted. I want to do what Jesus did, what these saints of St. Louis were doing. What is different about this February from the last sad one I had is that I wholeheartedly trust the leaders of my current congregation. They have voiced their support many times over. What is different about this February from the last one is that when the theological students from my school who attended the conference returned home, the first thing they did when they saw me was hug me. What is different about this February than last is that in my sadness, I see people fighting for me and my siblings, with all of themselves. I see them right on my screen. I hear them loud and clear. When people ask me how I’m doing in the wake of this vote, I say that I’m doing okay. I say that I’m grateful to have been disappointed by a faith community four years before, because I had learned how to be disappointed by those who claim a faith but instead do harm. I say that I am in the best and safest location possible for this to be happening, because of my congregation and my theo student friends. I say that I am okay because the minute the Conference legalized discrimination, the queers started singing, and you can’t stop the queers from singing. Not today, not tomorrow, not ever. It is my belief that I saw the best of faith that night. Because those at the witness remembered how Jesus was crucified for his practices that challenged the system. Because those at the witness were ready to lose their voices before they allowed a vote to determine how dogma viewed and attacked queer and trans lives. It’s hard to make any of this simple. But there’s essentially two main roads a queer/trans Methodist or an ally Methodist can go down now, and I believe both of these roads are valid. One could leave the church in search of a denomination that is entirely affirming. One could stay in the church to fight for change. To see pastors with dyed hair and denim jackets, with loud voices and with outstretched hands, makes me want to become a Methodist more than ever before. To become a member who dissents with the book that tries to attack my sacredness. To stand and sway and stomp my song of my community. I am reconstructing my faith. I am learning how to pray again. I am learning who God is again and who God is to me, and more and more, I am liking thinking of synonyms and equal signs, that God is Love, that Prayer is Resistance. It took me to love myself to get myself away from the abuse of my first church, it took my resistance to find a better home. I find more God and more Prayer in those actions than anything that I have ever done before. After watching the livestreams for two hours, and after the protestors agreed to reconvene for more prayer at the hotel, I closed my laptop, I ran to the campus convenience store, I got a pizza and a milkshake. I posted a selfie of myself with a smile and a peace sign, I wrote how it’s gonna be a long night, and how I am gonna watch the livestreams until they’re done. I am going to be a witness to the opening of the gates. I am going to be a witness to every February to come. I learned how to be a saint that night. Alyssa Sileo’s Thespian identity comes first and foremost in anything she carries out. As a member of the Drew University Class of 2022, she studies theatre arts, women’s and gender studies, and Spanish. She’s a proud NJ Thespian Alumni and member of their state chapter board. She is the leader of the international performances network The Laramie Project Project, which unites worldwide productions and readings of the acclaimed Tectonic Theater Project play and encourages community-based LGBTQ+ advocacy. Alyssa is humbled to serve as the 2017 Spirit of Matthew Award winner and as a Youth Ambassador for Matthew Shepard Foundation. She believes there is an advocacy platform tucked into every piece of the theatre catalogue and intends to write outreach into the canon.